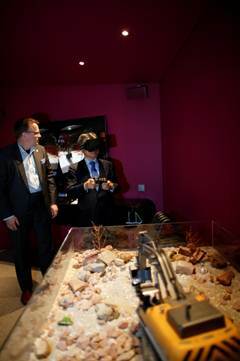 Chang-gyu Hwang, CEO of South Korea's leading telecom provider KT, visited Ericsson (NASDAQ: ERIC)'s headquarters in Stockholm, Sweden, on May 29 to meet Ericsson President and CEO Hans Vestberg. The two have agreed to strengthen their collaboration in leading the 5G evolution and to extend this to the Internet of Things (IoT). Hwang said during the visit: "We are delighted to lead 5G next-generation network technologies in cooperation with Ericsson, the world-leading provider of communications technologies and services. KT is preparing to preview the world's first, innovative 5G communications services at the PyeongChang 2018 Olympics. Our cooperation with Ericsson will strengthen our strategy to lead 5G and provide seamless connectivity to our consumers." Ericsson and KT have been working closely together to enable the Networked Society. They have successfully verified heterogeneous network carrier aggregation technology, a key element of 5G last year. More recently, they have successfully demonstrated 5G Multipoint Connectivity with Distributed MIMO with 5G mobile device equipment installed in a moving vehicle. Multipoint Connectivity with Distributed MIMO with 5G enables the connection of a large number of small cells without interruption, and eliminates possible blind spots in coverage areas. This makes it possible to support gigabit-level wireless services like hologram video communication to moving vehicles. Hans Vestberg said during the visit: "We will take the lead in developing 5G technologies in collaboration with KT, a leading mobile telecommunications service provider in South Korea. We will actively cooperate with KT to achieve 5G international standardization and the successful evolution toward 5G communications." The next generation of mobile networks, 5G is expected to be commercially available from 2020, but Ericsson already has live indoor and outdoor 5G test networks in Sweden and the US. KT will also start a 5G indoor and outdoor test bed at its R&D center this year in collaboration with Ericsson. The two companies will jointly develop and verify 5G mobile broadband access technologies in 5G candidate frequency bands, ultra-dense network operation technologies, and 5G core technologies and systems to provide gigabit-level data speeds and connectivity with ultra-low latency. Through this active cooperation with Ericsson on 5G development, KT aims to provide the world's first, innovative 5G communications services at the PyeongChang 2018 Winter Olympics in South Korea. As today's mobile technology alone will not be sufficient to maintain high-quality connections as traffic grows and the number of connected devices increases through the IoT, Ericsson and KT have also agreed to explore new B2B and B2G IoT business opportunities. During Hwang's visit, as an extension to their memorandum of understanding (MoU) agreed on at Mobile World Congress 2015 for collaboration on the next-generation networks, KT and Ericsson signed another MoU for collaboration in the area of the IoT.